After a horrific loss to Missouri, many fans are wondering if the Arkansas men’s basketball’s tournament dreams are over. There is nothing positive to say about the Arkansas men’s basketball team’s loss to Missouri this past Saturday. It was a game that Arkansas absolutely needed to win and more importantly should have won. It is impossible to sugar coat it as anything more than a bad loss but is it the end? Obviously, there is more basketball to be played for the season as well as the SEC tournament but is there still a chance for Arkansas? Let’s start with taking a look at the RPI rankings and see just how bad Arkansas fell. They went into the game at 36th and as of today, they are still 36th. How can that be? Shouldn’t the Hogs have fallen after such a terrible loss? In football, my friends and I have deemed one Saturday a season as the day of Armageddon. This is the day that is full of upsets unlike any other during the season and it creates total chaos in the college football world. In basketball, there is a big difference. This actually can happen multiple times in a year and has kind of happened twice this season with Saturday being the second time. The thing to remember is that when all the teams that should have won lose, there is not a whole lot of movement in the rankings. This past Saturday was chalked full of upsets. 2nd ranked Baylor and 3rd ranked Kansas both lost to unranked teams at home. On top of that, 5 Arizona, 7 West Virginia, 8 Kentucky, and 9 Virginia all went down on Saturday. As far as the rankings go, the AP will have significant changes I’m sure but if you take a look at the RPI rankings, there is very little movement. If Arkansas was gonna pick a weekend to poop the bed and lose to a very bad team, then this was the weekend to do it. 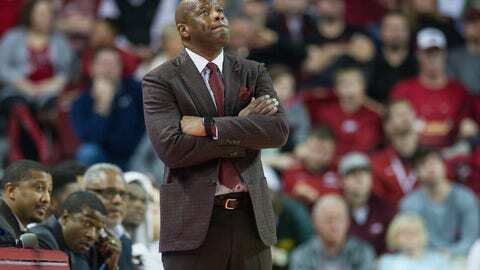 Now that we have the standings taken care of and have recapped the scorched landscape of NCAA Men’s Basketball, let’s take a brief look ahead at the challenges Arkansas faces. And believe me, there are some landmines ahead for the Hogs. Starting off the final eight-game stretch is a home game against Vandy tomorrow. The Dores are 60th in the RPI and are 12 in the SEC. Hate to say it but Arkansas has to win this game. Thus we have our first must-win. Next up is LSU in Baton Rouge. LSU is 13th in the league and their RPI, well I got tired of scrolling down to find their ranking but finally got there at 145. Needless to say, this is the Hog’s second must-win. The game on the road against South Carolina is already marked as a loss on my sheet. The Gamecocks have only lost to Kentucky in league play and are currently sitting at the top of the SEC and 18th in RPI. More than likely the Hogs lose. Ole Miss comes to town the following week and this is definitely a land mine for Arkansas. Ole Miss may have is pretty good in all honesty and even came within three of beating Baylor. This one is gonna be a toss up in my opinion but the Hogs need the win for NCAA Tournament purposes. Arkansas then goes back to the Bud for a rematch with Texas A&M. Sitting at 11th in the SEC and 84th in the RPI, the Aggies are a must win for the Hogs in this final stretch. They beat them for the first time in basically forever in College Station earlier this seas but the Hogs had to make a huge comeback. I don’t expect this to be easy but Arkansas has to win. The Razorbacks travel to Gainsville where they will lose to Florida. The way I see it, if Arkansas was going to beat Florida, they would have done it earlier in the season when the Gators came to town but they didn’t then and I don’t see it happening now. Arkansas finishes out the regular season against Georgia at Bud Walton Arena. The Dogs are 10th in the SEC and 54th in the RPI. This is the final game for the Hogs and is also a must-win. If the Hogs win their must-wins and lose the probable losses, Arkansas finishes at 6-2 heading into the SEC Tournament. The likelihood of that being reality is pretty slim. Like I said earlier, there are some landmines ahead and the Hogs are likely to step on one. The ideal situation for Arkansas is to win their must-wins and then split the South Carolina and Florida games. If they could beat one of them, it would obviously be tremendous for the Hogs chances to get to the dance. If I had to say which one they could have a .01% chance of beating, I’d go with the Gamecocks. I am not getting my hopes up, though. Arkansas isn’t entirely dead just yet but they are definitely in a coma and not expected to come out of it. The loss to Missouri was as bad as it gets and the Hogs couldn’t afford it. Bracketologist, Joe Lunardi had Arkansas as the 9th seed in the West before Saturday. As of now, he has moved the Razorbacks over to the Midwest while keeping them at a 9 seed. Take that for what it’s worth I suppose but the reality is Arkansas has a lot of work to do before they ever even get to the SEC tournament. Woo pig.